Are you confused and overwhelmed by books giving you “1001 and guitar chords”? Do you know some “jazz chords” but are sometimes unsure of where and how to use them? Do you have down the basic “jazz guitar” chord vocabulary but are looking for a way to bring your comping, chord/melody playing, and sense of harmony to the next level? Are you relatively new to playing jazz guitar and looking for a clear, logical, and thorough system for learning about chords and jazz harmony? Are you an intermediate or advanced player wanting to incorporate a more modern sound and/or a more pianistic approach into your chord playing? If your answer to any of the above questions is yes, I believe that this series of classes can help you achieve your goals. 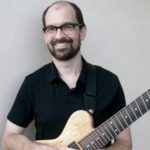 This multi-part series covers the application of jazz harmony to the guitar for comping, solo guitar arranging and improvising, and bringing harmonic ideas to soloing within a group context. The classes focus on a detailed and systematic step-by-step approach for building a strong foundation for chordal and contrapuntal playing and will cover everything from the essential basics to more advanced and modern concepts. 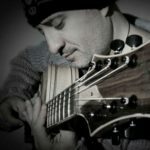 Numerous musical examples are demonstrated as well as written in traditional notation, tablature, and/or chord grid form, but the material has been designed to be open-ended enough that you will be encouraged to find your own path and work toward developing your unique musical voice. Tom has a great way of breaking down music theory as it’s applied to the guitar in a simplified and systematic manner that anyone can grasp. Definitely gave me a new perspective on some aspects of theory I wasn’t aware of and confirmed my uncertainties (I am self taught) of what I did know. Part one primes you for the knowledge you will need to proceed forward on your journey with these jazz lessons. I would highly recommend these lessons to any guitar player looking to advance their musical knowledge and familiarity with the instrument. Thanks again Tom! The fundamental building blocks of jazz harmony immediately applied to the guitar. If you are a beginner in jazz and don’t want to have "holes" in your development these series are for you, and if you’re not you can still find some interesting stuff like contrapuntal movement in diads. Also recommended for jazz teachers. La parte 1 de 5 videos estupendos donde viene lo principal sobre Harmonia, con ejemplos y ejercicios. Para mi es la mejor coleccion de clases que he visto. Gracias Tom. Wonderful introduction to this basic but important material with a very inteligent approach. The best is Tom explains in a simple and effective manner, with a lot of applications like counterpoint, ear training, fretboard visualization, among other things. Also is almost 2 hours long. Tom speaks slowly and clear, and that´s really helpfull to me, because english is not my native language, but I could understand all of it without problem. Five Stars!